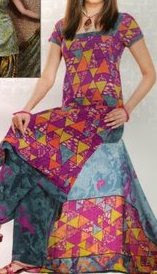 Salwar kamiz or Salvar Kameez is a Indian Traditional dress for Indian women. This concept of salbar kamiz came from the region of Mughal in India. During this period this salwar kameez became a social status. Many Indian Dresses like lehenga, churidaar et cetra generated during Mughal Period.This Salwar kameez is also considered to be the traditional dress of Punjab state of India. This is very common apparel of Punjabi Women of India. Traditional Indian women clothing particularly the famous Salwar Kamiz is, and has always been, unique with beautiful Indian designs and colors. It is very unique and beautiful. 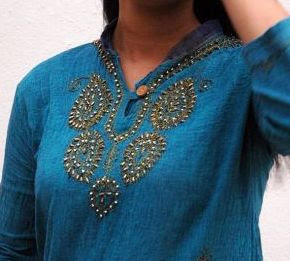 It is unique because most of kameez well handmade embroidery and design. The dress is really long and made of cotton with a combination of different colors. The dress comes with a matching trouser pant and a dupatta or chunri. The neck designs are very nice.